Author: Maarten Mous. Series edited by: Wilhelm J.G. Möhlig, Bernd Heine. 8 pp. Roman, 70 pp. The Mbugwe form a small ethnic group that live in Tanzania, Arusha province, Babati district, around the town of Magugu, in the villages Mwada and Mdori, and others. The Mbugwe numbered about 10,000 in 1910 according to Dempwolff but only 5,000 in 1967, and at that time this number was on the decline. For 1999 SIL estimates 24,000 speakers. According to some oral traditions the Mbugwe are originally Rangi people that moved northwards in search of salt and then settled there. The neighbours of the Mbugwe are all non-Bantu. However, the present situation shows a different type of language contact: as a consequence of recent settlement of people from various parts of Tanzania in this rice-growing region the Mbugwe language is increasingly under pressure from Swahili. The present study is based on a short period of fieldwork in 1993. The poor state of documentation of this interesting language justifies the publication of this grammatical sketch which allows a short view on the richness of the Mbugwe. The book offers an outline of the phonological and grammatical features of this small and understudied language. In addition to the grammatical sketch, three texts with interlinear glossing and free translation are included, as well as a Mbugwe-English lexicon with an English index added. This study is written to stimulate others to study Mbugwe and to undertake the task of writing a fuller grammar of this interesting language. 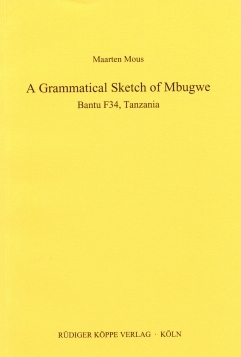 Maarten Mous’ short book in Köppe’s popular series of grammatical sketches addresses this challenge, and provides us with more information about Mbugwe. […] this short sketch of Mbugwe contains plenty of intriguing material and provides a good first introduction to the main structures of the language. It will lead no doubt to further descriptive, analytical and comparative studies.